Rated at 4,000 to 6,500lbs. Komatsu’s heart-of-the-line BX50 series redefines the forklift once again. Whether your application calls for an agile and maneuverable cushion tire model for indoors, or the flexibility and power of a pneumatic model for outdoors, the BX50 series is sure to meet your needs. The BX50’s superior performance can increase productivity, minimize operator fatigue, reduce operating costs and improve the working environment. Boost your bottom line now—put a BX50 to work in your application today. The Komatsu Komfort Zone is a dual floating structure that protects operators through advanced ergonomic design and reduces the effects of engine vibration, noise and heat. 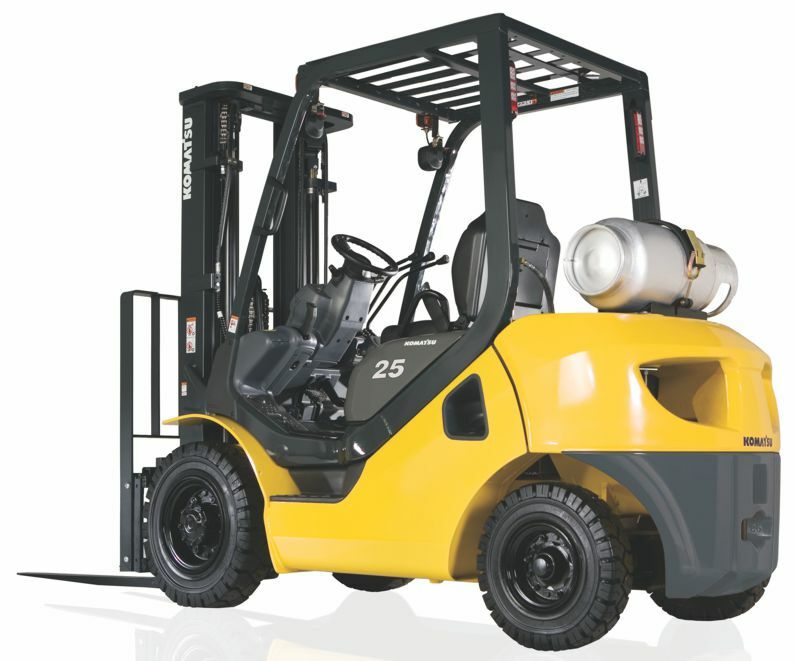 Vibration-dampening mounts separate the engine and transmission from the forklift’s frame. Additional suspension mounts isolate the operator compartment from the frame. The heavy-gauge steel frame, front axle and heavy front fender connect to deliver high strength—critical for high lifting and heavy loads. With the excellent visibility window on the EZview mast, the BX50 operator has an unrestricted view of the fork tips and surroundings. Towards the front, the newly designed EZview mast, console and low-profile dash give maximum visibility. To the rear, the upper corners of the counterweight are angled for clear sightlines in reverse. Even when the BX50 is sitting still, its Fully Hydrostatic Power Steering (FHPS) system allows east steering. The FHPS system also reduced operator fatigue by eliminating kickback. Operator feel and control are improved by a small-diameter steering wheel and an optional spinner knob allows easier, one-handed steering. Hot engine air and exhaust gases are tiring to the operator. On the BX50, angled ports aim hot engine air away from the operator while traveling in reverse. Exhaust vents located low on the counterweight keep exhaust gases away from the operator and also away from the floor to avoid stirring up dust. The high torque delivered by the BX50’s powerful K21 and K25 engines is channeled through a new transmission designed and manufactured by Komatsu. This rugged new drive train features an aluminum alloy transmission case for improved heat dissipation, high-capacity oil cooler or torque converter, and O-ring face seals to greatly reduce the possibility of leaks. Komatsu’s extensive experience with demanding construction machinery applications led to a highly reliable, highly dust-resistant, double-seal universal joint design in the full floating BX50 drive train. KOPS Plus – standard on the BX50 – locks out lift, lower, tilt and traveling functions when the operator leaves the seat for more than three seconds. They do not resume until the operator returns to the seat and resets the controls. A flashing yellow warning light alerts the operator when the KOPS lock is activated. In addition, the forks cannot be lowered while the key is in the off position.